VIDEO CONFERENCE PARTY LINE is a series of scheduled video callz focusing on the process of video making, collaboration and distance. Petrichor Performance Collective and Panoply Performance Laboratory present an exchange of ideas and performative works in Brooklyn and Boston entitled Practice, Practicing, and the Perpetual Becoming of Performance. Friday, November 7, 2014 and Saturday, November 8, 2014, Petrichor artists present performances and talks at PPL Space, Brooklyn. How does an artist design and practice a practice? More importantly, how does an artist practice within constantly fluctuating ways of learning? 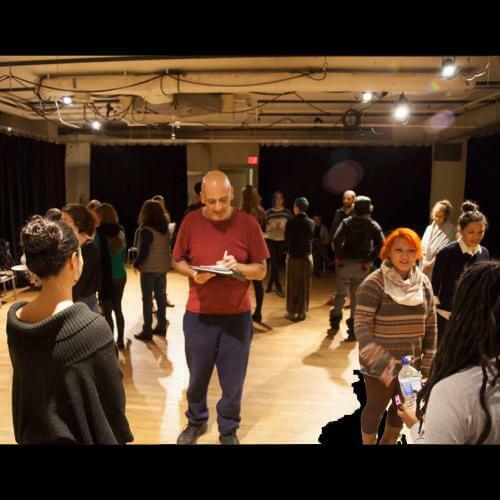 This performance exchange is meant to address questions of process and pedagogy and to interrogate collectivity and community as a part of the practices of artists operating in Boston, New York City, and beyond. Performance art, termed as such, has experienced a major shift between 2006 and 2014 “inside” and “outside” art worlds. The “professional” artists from the NYC area and student artists alike will ask critical questions of themselves and each other to determine how the MFA program, the collective, the artspace, the panel discussion, and other forms of social learning, are integrated within performance art practices today. The artists will question pedagogy, community, collectivity, and how our organizational and pedagogical practices operate in conflux with our performance work. Group discussions in each location with be focused around making a practice and will be allowed to digress in any of these directions. This exchange is curated/organized by Helina Metaferia and Esther Neff, respective members of Petrichor and Panoply. In Edinburgh, the performing artists will be: Sarah Boulton Sian Robinson Davies Jessica Dunleavy Harry Giles James Harding Marcus O'Shea Anthony Schrag Angelika Sikorska-Mazur Cate Smith. Panel Discussion: 4pm on Saturday, June 23. Suggested donation $5-15 at the door only. The Compendium invites these artists to research their relationships with technology, technicalities, and technics. Artists across disciplines manipulate, access, and utilize objects and systems, interacting with technics that are present in performance situations, both as part of the technicalities of presentation, and as instruments, tools, devices, visibility and amplification aids, and as part of documentation, methodological means, and aesthetic and political vehicles. We ask, how do artists use technical means to their ends? How are techniques and technology related and/or unrelated? How are technics/technology/techniques developed and chosen as part of artistic practice, using what kinds of concerns? Who has access to technology and techniques/technics and how do they commodify/become commodified and/or de-commodify/become de-commoditized? Friday June 22: Artists will perform in the CPR spaces in the absence of colloquially-defined “technology,” sans electricity, sans amplification, stripping the work to all but conceptual forms of technics. Audiences must be present in the space to experience the work. Documentation will consist of written descriptions. Saturday, June 23: Artists will have access to CPR’s “cutting edge” technological array, including multiple projectors, sound system, and lighting grid, and may bring in their own technological devices, set-ups, and mechanisms. Audiences may view streamed performances from computers all over the world and performances will be documented on digital video. A public round-table discussion on Saturday, June 23rd at 4pm will allow us to reflect on the collective research performed, involving the artists from the project and including other voices in live performance. Compendium is a collective advocating for and practicing intersocial support systems for artist-organizers. Compendium: Technics was curated by the Compendium’s Thomas Bell (Spread Art, Remote Control Tomato), Ian Colletti (Vaudeville Park), Christina DeRoos (Spread Art, Remote Control Tomato), Valerie Kuehne (The Super Coda, multiple projects as a cellist), Brian McCorkle (Panoply Performance Laboratory, Varispeed, other projects), Esther Neff (Panoply Performance Laboratory, PERFORMANCY FORUM),and Paul Pinto (thingNY, Varispeed, Seven Immediacies Series).